Pyrolon CRFR 2.5 Coverall. 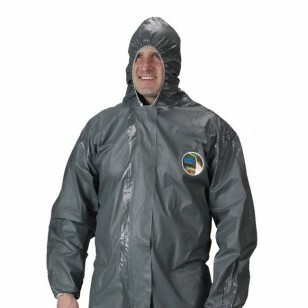 This Coverall features a hood, elastic face, storm flap over zipper, wrists, and ankles. Disposable, Chemical Resistant, and Flame Resistant, all rolled into one garment. Pyrolon® CRFR protective wear... Unique, disposable, chemical resistant, and flame resistant, meeting the NFPA 2113 requirements for section 5.1.9. Imagine, all these qualities in one protective garment. Pyrolon® CRFR stands above the competition and is exclusively manufactured by Lakeland. Pyrolon® CRFR garments bar contaminating flammables like paint, oil and grease, hazardous liquids and contaminants, and dry particulates from penetrating to inner clothing. Pyrolon® CRFR features: Light chemical splash protection, Self extinguishing, Won’t melt or drip, Meets the NFPA 2113 requirements for section 5.1.9, Designed to be worn over woven thermally protective coveralls, such as woven Nomex®, for environments where flash fire is a concern.